AS the food trade is being devastated by the runaway horsemeat scare, a round-table meeting on the crisis took place last Friday (15 February). 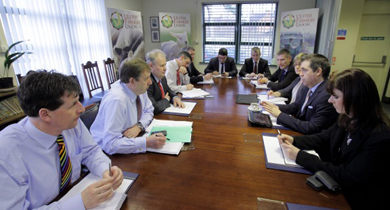 NIIRTA has held a meeting with the UFU to discus the horsemeat crisis. The Northern Ireland Independent Retail Trade Association (NIIRTA) has given its full support to the collective call by the Ulster Farmers Union and other key stakeholders for a Food Supply Summit to be jointly hosted by the First and deputy First Ministers.